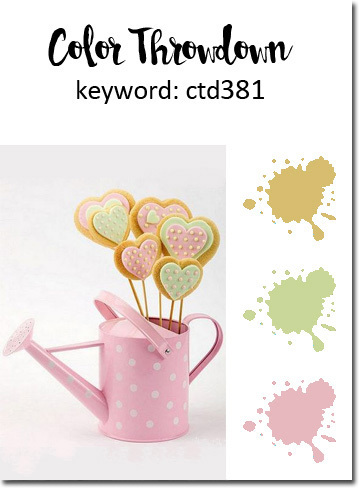 The colors are kraft, pink and pale green. Of course, when I saw those colors, I immediately thought of flowers! I wanted to try pencil coloring on kraft after seeing some beautiful cards on my friend, Sonja's blog (and having received one from her in real life!) So I took a new Unity Stamp flower stamp and stamped it onto some Desert Storm cardstock. I then very loosely colored it with pink, green and white Prismacolor pencils. The sentiment comes from Verve and is one of my favorite sympathy sentiments. I layered the panel onto black and Pink Pirouette and then onto a Desert Storm cardbase. To finish the card, I kept it pretty low-key and only added some Rainstones. Thanks for visiting. Be sure to check out the fabulous creations from the team at Color Throwdown - they amaze me every week with their gorgeous cards! Stunning card Karren, really is effective pencil on kraft. So eye catching. I envy you coloring talent! Beautiful !!! 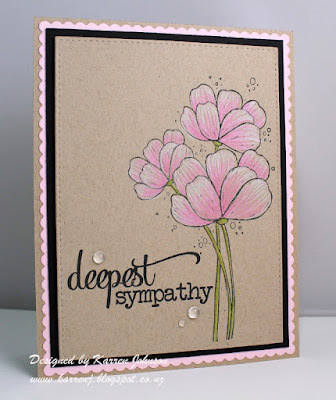 love, love, love this card... so soft and pretty!!! What beautiful coloring, Karren...the flowers look fantastic!!!! I'm so glad you joined us this week as our Guest Star Stamper!!! Saw this lovely card on the CTD blog and had to come over to tell you how lovely I think it is. Beautifully coloured! Then I peeked at some of your other creations/posts - amazing! This is gorgeous, Karren! 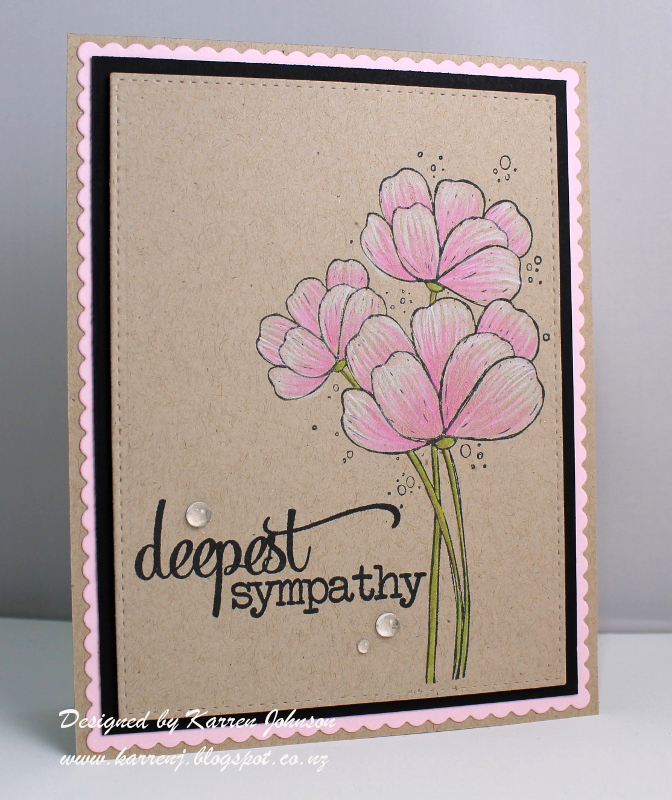 Your prisma colored pencil work on the kraft card stock looks amazing on your flowers. Simply beautiful! 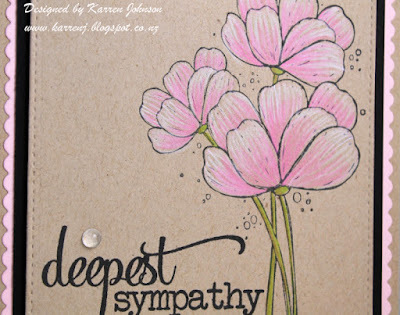 The colored pencil on the kraft is perfect with your floral image. Simply beautiful! Love the layering and coloring technique! 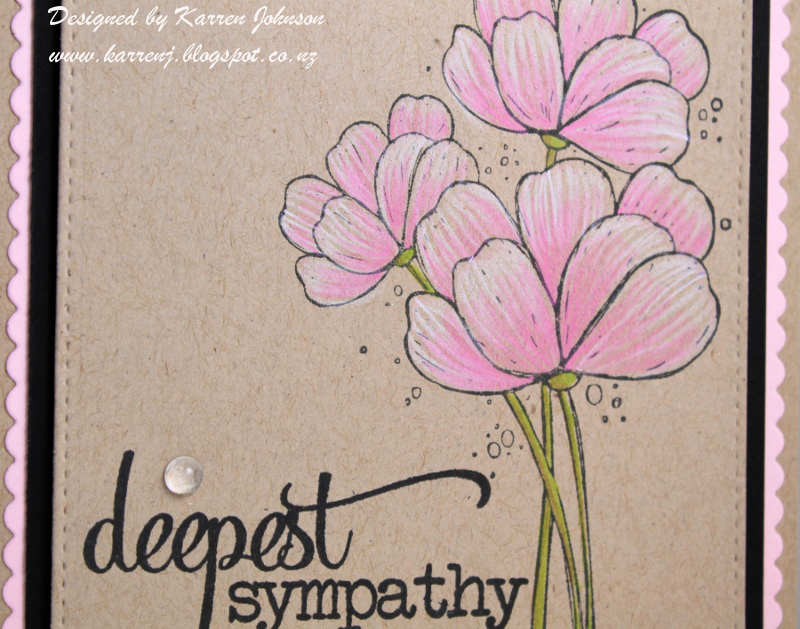 Your pencil coloring on Kraft is gorgeousn, Karren! Thanks so much for helping us out this week!